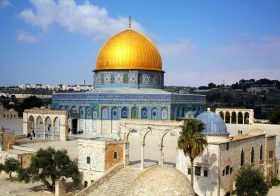 EXECUTIVE SUMMARY: Mahmoud Abbas’s decision to attend Shimon Peres’s funeral on Mount Herzl – a highly meaningful Zionist site, and extolled as such by President Obama – should not be taken lightly. It required atypical courage from a man in fragile health, much reviled by many Palestinians, at a time of myriad conspiracies against him. 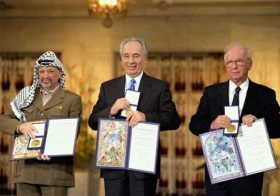 This was another milestone in a complex journey that has taken Abbas from the service of the Soviet Union to an American orientation, and taught him the futility of the “armed struggle.” He does continue, however, to lionize “lone wolf” murderers, and to insist that Israel cannot be recognized as the nation state of the Jewish People. What brought Mahmoud Abbas to Mount Herzl? Perhaps the realization that Palestinian options are limited, and are getting less promising as time goes by. The “One-State Solution” is a fear-mongers’ intellectual construct, not a viable option. Violence will achieve nothing but more pain. 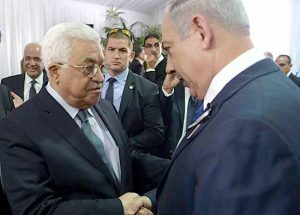 The vision of international coercion, cooked up by the Palestinian chief negotiator Saeb Erekat, has delivered little – though it is possible that Abbas’s attendance at the funeral was tied, explicitly or implicitly, to an American quid pro quo at the UN Security Council. The presence of “President Abbas,” as President Obama noted in his own oration, was indeed an indication of the “unfinished business of peace.” It was, in its own way, an important (if symbolic) event. It may well be the case that for both Abbas and Netanyahu, there are good reasons at the moment to avoid taking things beyond the handshake and brief conversation caught on camera. Their fleeting interaction nevertheless represents a milestone that should not be taken lightly. 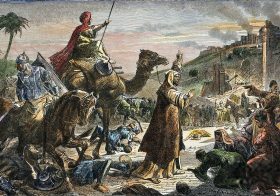 It took courage, which Abbas does not often possess. Here was a man in fragile health – he underwent a coronary bypass a week after the funeral – and besieged by Arab plans to bring in his hated rival, Muhammad Dahlan, either as his successor or as the power behind his successor. It was not an easy moment at which to ignore bitter criticism. Yet he did attend the funeral, and was seated in the front row amidst Israeli flags at the very pinnacle of Zionist symbolism, the sacramental spot at Mount Herzl where Israel marks its sorrows and joys. His decision was made all the more remarkable by the absence of neighbors with whom Israel has much warmer relations, such as King Abdullah II of Jordan and President Abdel Fattah Sisi of Egypt. Abbas’s decision remains highly controversial. Hamas has made use of it to call him a traitor, and the Palestinian social networks have heaped abuse on his head. Even the political leaders of Israeli Arabs – indeed, the entire “United List,” which represents most of them in the Knesset – decided to remain absent, making his presence even more striking. In the face of such predictable opprobrium, why did he attend? While not always willing or able to translate his own insights into action, Abbas has been one of the more far-sighted leaders in the Palestinian national movement. He was once a Soviet agent, as the recent revelations from the Mitrokhin Archive confirm. The fingerprints of the KGB 10th Directorate are clearly visible on his infamous Ph.D. dissertation, which purveyed poisonous anti-Zionist propaganda about alleged Zionist collaboration with the Nazis. But Abbas’s close association with Moscow, and his understanding of what ailed it, also made him the first of his circle to grasp that the Soviet project had failed, and to begin to reorient the PLO towards the US. 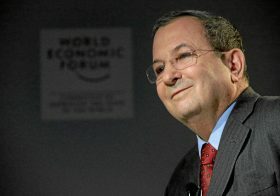 More recently, the shock of seeing the Americans abandon their friends, particularly Husni Mubarak, added to Abbas’s natural caution at the negotiating table. This caution underlay his stubborn insistence on doomed preconditions that would help him make his case to his own people. His stances are thus often self-contradictory. In 2002, he plucked up the courage to criticize Arafat for choosing violence (“militarizing the Intifada”) – but when violence erupted again in 2015, he expressed support and admiration for the “lone wolf” attackers killed while taking, or trying to take, the lives of Israelis. He continues to authorize counter-terrorism cooperation with the Israeli security forces while paying fat checks to the families of terrorists killed or caught. He has spoken words of peace, but adamantly refuses to recognize Israel as the national state of the Jewish people. He seems at times to wish to enshrine the Palestinian position that Judaism is a religion, but the Jews are not a people. If that is indeed his position, what was he doing at the place most intimately identified with Jewish peoplehood and the Zionist project? To understand what led him there, it is necessary to reexamine the basic choices facing the Palestinians. Israel is strong, both militarily and economically. Despite severe disputes with several American administrations, it continues to enjoy a special standing in the hearts and minds of Americans. The Palestinians are weak, poor, divided and increasingly marginal. It will be no easy task for them to secure an outcome that does not reflect this imbalance of power. The Palestinians can let go of their separate national identity (as a strategy, only to restore it when the time comes) and seek to destroy Israel “democratically” by calling for a one-state solution. The underlying assumption is that this would soon give them a majority in a reconstituted Knesset through which they can dismantle the Zionist project. 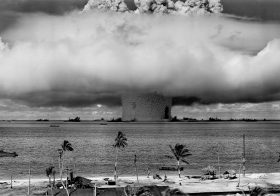 This fantasy is popular with some intellectuals, and used by Israeli fear-mongers on the left as a warning against the consequences of present policies. But unless Israel commits institutional suicide on a massive scale, this is unlikely to happen (nor can it really be enforced through international coercion). It is useful as an abstract template against which to measure the dangerous outcomes of specific decisions on the ground. It is not a practicable option. The Palestinians can use violence to cower the Israeli people into submission. This is something even Hamas understands to be unfeasible, though it remains at the core of its ideology of muqawwama (resistance). Despite Palestinian propaganda and Abbas’s own virulent and de-humanizing comments about the “herds” (qut’an) of settlers, it is safe to assume that he still stands by his long-time realization that a resumption of the “armed struggle” would be a disaster. He is certainly hearing that from his key allies in the Arab world, above all Egypt and Saudi Arabia, for whom a flare-up of Palestinian violence is the last thing they need as they battle their real enemies (Iran, ISIS, and the Muslim Brotherhood). Hence the continued security cooperation with Israel, now headed by a unified command structure led by Majid Faraj (who joined Abbas at the funeral). This state of affairs contrasts sharply with the chaotic days of Rajoub, Tirawi and Dahlan chasing each other around, as was the case under Arafat. The Palestinians can attempt to corner Israel through international pressure, whether that of the global BDS movement or that of the EU and ultimately the UN (if the US allows it). This course was popularized by Erekat, “the Chief Negotiator” and propagandist. It rests on Israeli vulnerability to its dependence on foreign markets and the psychological impact of perceived isolation. Israel’s regional and global standing may have actually improved in recent years, but the Palestinians are still central to the concerns of a highly vocal minority of committed “progressives” in northwestern Europe and parts of the North American elite, who are able at times to shape the national agenda. But on closer examination, the coercive option looks less and less promising. 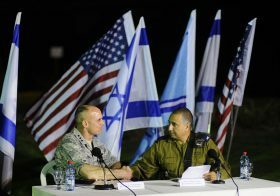 The US remains formally committed to Israeli security. The European “guidelines” had less of an impact than expected, and are in any case limited to a very narrow spectrum of products and activities. Even the ultimate weapon of coercion – the International Criminal Court – is proving less useful to the Palestinians than they had hoped. Two and a half years after the Palestinians’ accession to the Statute of Rome, a team of ICC prosecutors, on their first visit to Israel, explicitly declared that they were coming not to collect evidence or even assess the adequacy of existing legal systems, but simply to engage in education and outreach. That is a far cry from what Erekat attempted to conjure up in 2014 when he advocated this strategy. The Palestinians can attempt to convince the Israeli people that a generous approach towards them is in their own long-term interest. Here and there, signs of such an approach have appeared, only to vanish again because of resistance or the presence of a more appealing alternative. By responding positively to the urgent request of Peres’s daughter, Tzvia Walden, to attend her father’s funeral, Abbas signaled that to some extent, he does understand that the ultimate tribunal on the prospect of a future outcome will not be in the Hague, but in the court of Israeli public opinion. It is possible, as mentioned, that Abbas’s decision to attend Peres’s funeral was coerced by the Americans, to be compensated by a quid pro quo at the Security Council during Obama’s lame duck period. But coercion might not have been the motivating factor. The Palestinian leader may well have come to doubt Erekat’s siren song. If Abbas does wish to reach out to the Israeli people, the effort cannot end with one symbolic act. Moreover, the traditional Palestinian approach to the Israeli political arena – trying to mobilize the committed Israeli left against their right-wing government – will no longer suffice. It would therefore be wise of Abbas to revisit the actual text of President Obama’s speech. It made very clear that Israel is indeed, by right, the embodiment of the Jewish people’s right to self–determination. The Israeli left almost exclusively chose to quote the passages in Obama’s speech that implied that Israel should do more for peace; whereas many on the right side of the Israeli political map are so livid about Obama’s policies as to have ignored his message altogether. But the speech did include strong, resonant Zionist statements about a nation restored to its ancestral homeland. This language, which Obama also used during his official visit in March 2013, should be the point of departure for any follow-up to the unique conjunction of participants and speeches at the funeral. Sadly, the State Department largely vitiated this possibility by counter-factually suggesting yet again that Jerusalem is not in Israel. This exercise in futility can only make it harder for sober Palestinians to hear what Obama explicitly said about the Zionist project, as well as about young people in the Arab world being raised to hate. But if they are ever to engage seriously with the Israeli mainstream, those words are precisely what they should take away from this extraordinary event.